With its comfortable body and distinctive voice, the M-120E provides excellent balance and a delicate tone. 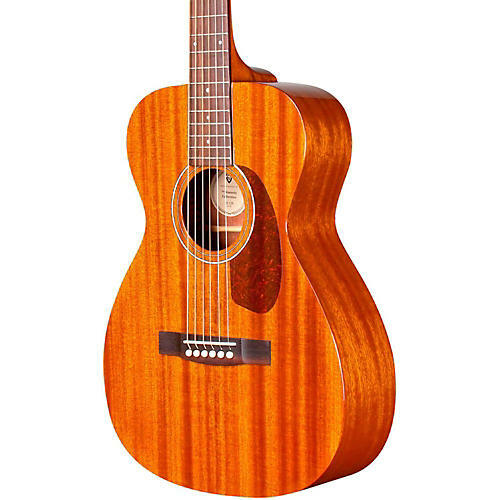 Featuring solid African mahogany top, back and sides, the M-120E' 24 ¾ scale length, vintage shaped Guild neck, and 1¾ nut width make this concert size guitar easy to play. The Fishman Sonitone pickup allows for expert amplification of this small-bodied guitar' incredibly rich sound. Additional features include an Indian rosewood fingerboard and bridge, NuBone nut and saddle, and period-correct tortoiseshell pickguard. A mother-of-pearl rosette and Guild' iconic Chesterfield headstock emblem reminiscent of 1960s models complete the package. The M-120E includes Guild' new lightweight polyfoam case.